I have recently been reading a book on magic. To be honest, it has proven to be a dire read indeed promising much but delivering nothing. Except, that is, for one thing. Throughout the book the author talks about energy following thought. I haven’t yet finished the book so maybe it will still surprise me but I doubt it. It seems to be a lot of promises to reveal something without ever revealing anything very much. However, the ideas that energy follows thought is a really interesting and different way to talk about attention. The person who wrote the book plainly knows his stuff but simply choses not to really give anything except broad brush content. Magic he says is about energy and energy follows thought. For me, magic is about where you put your attention and so is reality. If you think about it, what he is saying is that if you think about hate and strife, you will provide hate and strife with energy in your life. Equally, if you think about peace and love, you will provide peace and love with energy in your life and that energy will help manifest those attributes. He is saying that we create our own reality and that we do so with thought. In My Haunted Life, I use an example of the pink car. In giving the thought attention or energy, I do indeed see pink everywhere and eventually I see a pink car. It’s a nice example of how attention delivers the goods. There are a couple of points around this concept that I think are worthy of reflection. 1. Unconsciously, what do you give your attention to? Worries, fears, jealousies etc? Why then would you be surprised if those manifest in your life? Take the time to meditate and be still. Reflect on yourself and your inner make up. Work on changing yourself and you work on changing the world. It really is that simple. 2. Magic works. Magic is really about a few basic but incredibly difficult things to achieve. Firstly, it asks you to work your entire life on (1) above and consistently and constantly improve yourself. Secondly, it gives you the tools to do it and these are imagination, visualization and faith. 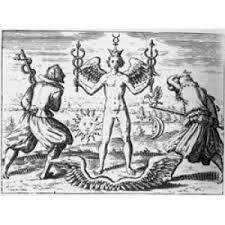 Thirdly, it gives you some methods and approaches to (1) and (2) above in meditation, ritual, dance, myth, and much more. You see, in my journey to become a magician, I have discovered that rather than magic be something mysterious, secret and somehow wrong, it is the key to life and that life is nothing more than a magical experience in a magical world. We are all magicians if we did but know it and we can all work magic. I am still a neophyte but through practice, each day I am grow more enlightened. I keep on reading books in the hope that, like Nicolas Flamel, I will discover the ultimate wisdom and approach to adepthood but deep down inside, I know that the book I seek is actually to be read in my psyche and beyond for my inner self already knows the answers that I seek.